Map It! 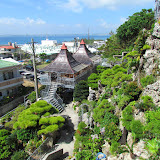 Okinawa: "A Cafe, Cave, and a Bonsai Garden – Introducing the Gold Hall"
"A Cafe, Cave, and a Bonsai Garden – Introducing the Gold Hall"
Kin Town is known to have many small attractions. There is Okawa, the natural spring, the Kin Kannonji Temple, and Nature Mirai. But it is also home to a one-of-a-kind cafe, appropriately named “The Gold Hall”. It's a fitting name for a cafe in Kin Town cause the word 'Kin' in Japanese also means gold. It's unique cause it's built primarily over a network of small caves and tunnels along a cliff. When you first enter you will arrive at the cafe portion. The workers will gladly greet and seat you. All around you will see different custom wooden decorations and ornaments skillfully handcrafted (See Photo Album). There is an entrance way that leads you down through some of the various tunnels and caves. As you navigate your way through, you will eventually enter the bonsai garden built along the cliff side facing the ocean horizon. There you will see an array of statues and bonsai trees beautifully displayed and dispersed throughout. You definitely want to bring a camera to see this place. The Gold Hall is one of the hidden 'treasures' (pardon the pun) in Kin Town. The cafe serves various desserts, sandwiches, and coffee menu items. And if you are really hungry you can ask for Kin's world renown Taco Rice! 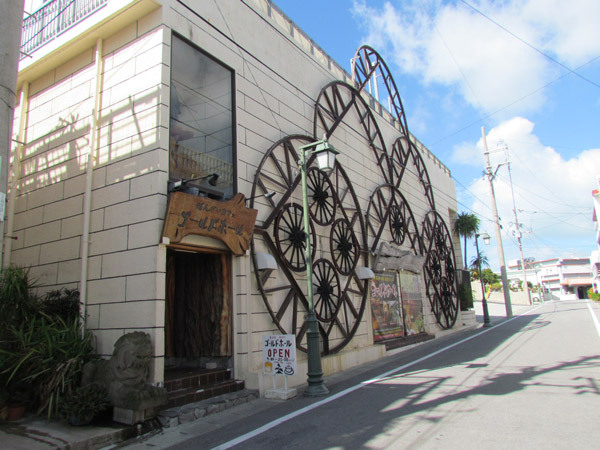 A little Okinawa trivia: Kin Town currently holds the Guinness World Record for the largest Taco Rice ever made with a combined weight of 746 kg (1,644 lb 10 oz). Menu prices range from 500 to 900 yen. Cover charge. There is a cover charge to enter. It is 800 Yen per adult, 500 Yen per child. Credit Card service is not available at the moment, but they do accept Dollars. Price in dollars may vary based on the current Yen rate. Hours. Open 24-7, 365 days a year from 9am to 8pm. Parking. Parking is available. See the green thumbtacks on the map. Getting there. The Gold Hall is on the opposite side of Camp Hansen. There are many ways of getting there from Hwy 329. The route in Blue is perhaps the easiest. Use Richamocha Cafe as a landmark guide. Other places of interest nearby: Kin Kannonji Temple, O-kawa, Statue of Oshiro Kozo, Kin Watch Tower, Kin's Castle Rock, Kinjo's Used Goods, Kin Town's Hidden Natural Trail, Kin Town's Cherry Blossom Way.